As anyone who has access to broadcast media, the internet, or gradeschool friend they have blocked on Facebook knows, we live in an era of hyperpartisanship. Which makes particularly noteworthy Congress' recent bipartisan passage of the biggest land conservation bill in a decade. The bill protects more than 1 million acres of wilderness across the country. It also permanently reauthorizes a program that uses revenue from oil and gas drilling leases to pay for conservation initiatives. And it closes off some areas to mining, permanently. In California, the bill dramatically expands desert wilderness, and protects dozens of miles of waterways that will be newly designated as wild and scenic rivers. David Lamfrom is the California desert and national wildlife director of the National Parks Conservation Association, and he's worked for a decade on this legislation. He talked last week with KQED's Brian Watt about what the bill means for the state. The following is a transcript of their conversation, edited for length and clarity. So how did a bipartisan conservation bill ever get through Congress? It's a great question. The reality is nowadays you don't see individual pieces of public lands legislation generally moving through the House or the Senate. What you see are these larger packages being put together, what are called omnibus public lands bills. Many of the pieces of legislation represented within that larger package had been waiting up to a decade to be passed. So it's not just a matter of 'Why now?" It's the fact that there has been a significant backlog of legislation related to public lands. The legislation is a profound conservation victory for areas all across the country. And there's something for almost every state in this? Very much so. The proof is in the pudding, in that it passed the Senate 92 to 8, and the House 363-62. So it had incredibly bipartisan support, and it basically flew through both houses of Congress. We're talking about a big expansion of wilderness protection. Will any private property be taken ? When we're talking about public lands, they're already owned by the federal government. Now there will be new levels of designation or protections added to them, but no private property was taken. 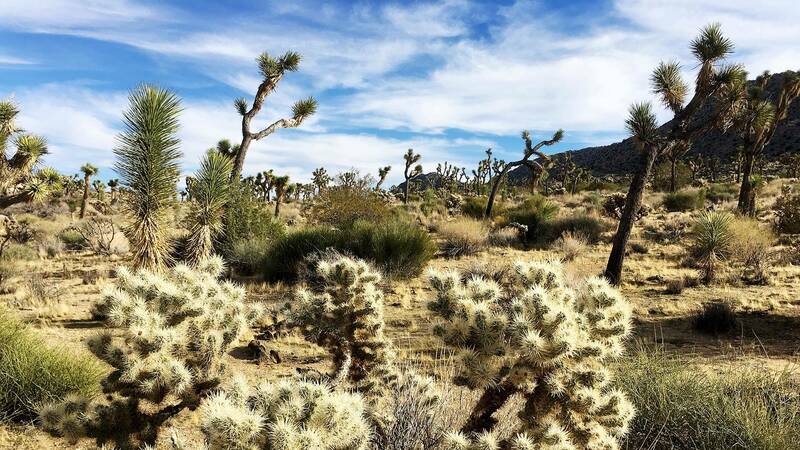 The legislation adds thousands of acres to Joshua Tree and Death Valley national parks. What does that mean for people who visit those areas and for wildlife? What we've seen in the California desert, especially over the past five years, is millions and millions more visitors every year. Now we're going to have just more remarkable landscape for people to explore, and I think visitors are going to be very excited. The other piece is that this is really important as wildlife habitat and for the ecological integrity of the park. The additions to both Joshua Tree and Death Valley are really significant ecological pieces that were missing. We now have an opportunity to connect a large landscape through conservation. For example, the designation of Soda Mountains Wilderness and Avawatz Mountains Wilderness, and the expansion of Death Valley National Park, means that the area between Mojave National Preserve and Death Valley will be protected in perpetuity, creating a pathway that wildlife uses and that will protect incredible cultural resources. There will also be long, beautiful vistas in a place that is really an intact ecosystem. We're protecting the very best of what remains. We heard last August that bird populations in the Mojave were collapsing due to climate change. Will these new protections help animals survive the coming changes? Here in the California desert, our ecosystem is going to be disproportionately affected by climate change. It's going to affect species; it's going to affect vegetation. Connecting the areas is a core strategy to avoiding the worst impacts, so that species can move to high elevations or low elevations to avoid temperatures that aren't as favorable as they may have once been. But if we're being really honest, that doesn't mean every species might do well in this new regime. But at least on the landscape level, it will create opportunities for species to thrive in a rapidly changing world. I understand the legislation is a really big deal for something called the Land and Water Conservation Fund. Can you tell us about that? But every single year, in addition to the legislators having had to appropriate money to this fund, they had to reauthorize the fund itself. This new legislation permanently reauthorizes it. We're not going to have to go through that step each and every time, and we can move forward with appropriating those funds.